Lets talk: #Enzo Ferrari. How many of you were collecting when this one came out as part of the #2003 First Editions? Only one color for this new model — bright #Ferrari red — and finding them was by no means, hard. At one point, I even had a small hoard of this and another 03FE, the Bugatti Veyron, as I had always been fascinated by #Exotics. As many of you already know, the prices of the Veyron skyrocketed when it was discovered by collectors that Bugatti no longer wanted the older style of the Veyron being produced. Shortly after, Hot Wheels and #Ferrari parted ways in 2015. Thats when certain #Ferrari models seemed to have a similar effect in terms of value. As good as the #2003 First Editions release of the #Enzo Ferrari looks, it can be had for several bucks nowadays. 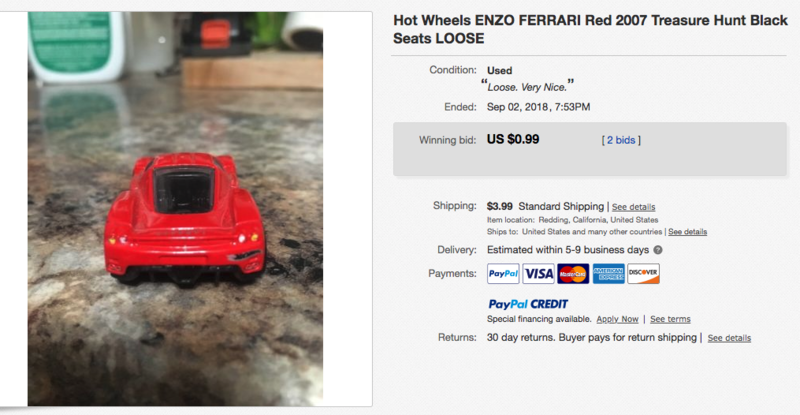 Compare that to some of the other releases of the Hot Wheels Enzo Ferrari (eBay > completed listings) … and you’ll see that many of those will cost you dearly if you decide to collect this casting now. In 2007, the #Enzo Ferrari had been released as a #Treasure Hunt. It was the first year of “Super Treasure Hunts” so the regular variant had similar red paint to the #2003 First Editions release, whereas the super had that spectraflame dark red paint — both coming with painted red seats on a black interior. It appears somewhere along the way some seats were missed, making for a “black seats” variation. Where the 2003 First Editions release comes into play is that it is commonly sold — by knowing and unknowing collectors — as that rare black seat variation of the 2007 regular #Treasure Hunts release. The 2007 #Treasure Hunts regular variant will set you back about $10-$15, or so. The black seats variation will cost you $25+ in today’s market. As you can see, the #2003 First Editions release resembles the regular 2007 Treasure Hunts release, but since the 03FE comes standard with black interior/seats, many are being “rebranded” as that rare variation. There are a fews ways to protect yourself from buying a fake though. First, check the rear! The biggest difference between the two is the silver/black Hot Wheels logo that appears on the #2003 First Editions release. Also, notice the taillights? The 03FE has a yellow/white pattern versus the 07TH which has a red/white pattern. There are a couple other subtle differences, but these two will help you avoid purchasing a 03FE rebranded as a regular 07TH with black seats variation. As far as the #2003 First Editions release of the #Enzo Ferrari, its truly a must-have in your collection as it comes in that signature #Ferrari red and is the #First Edition of the casting. As for the time-being, you won’t see this released in red — or any other color — as it is a #Discontinued Casting that hasn’t been seen since 2014. It had been released in red several times in its Hot Wheels run from 2003 to 2014, but none will come as cheap as finding the 2003 First Editions release. Its a great piece and if you can find it for a couple bucks, its a worthy pickup. RELEASE DETAILS: Red Enamel Body (metal). Clear Windows. Black Interior. Chrome PR5 Wheels. Black Base (plastic). Made in Malaysia. Toy# 56387. Released in 2003 as #24 of 42 in the 2003 First Editions series (#036/220 in the 2003 mainline).